-Made of high strength heat resistant ABS, strong and durable. -Take the effective quarantine and dust proof , protect the power supply and wire. 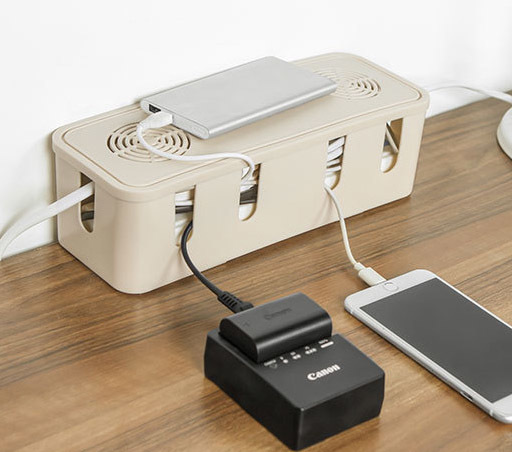 -Convenient for placing it On or Under Desk, Next or Behind to Computer, TV and other Electronics equipment in your home or office. -It 's a Ideal Solution for tangled Wires neatly organized and managed. -Suit for Power Strip, Outlet, Surge Protector, AC Adapter, Charger, USB HUB, Network HUB, Router, -Computer, etc. -Easily concealed and protected wires & power strip from Children, Pets, , Dust and other Accident.